On a perfect night for football, the score 49-7 for the Tigers might indicate a near perfect game. But head coach Haggett, although happy for the rookies, expressed there is “still a lot to work on”. Offensive co-ordinator Brown thought rookie QB Chris Duplisea had done “a good job” and the O line had “played well”. Duplisea (who throws a laser type ball with very little air under it) had stats that would have been much better if not for a number of dropped balls in the first quarter. Returning receiver, Alistair Chauhan, was the target for the Dal QB’s first TD pass of thirty-four yards. Near the end of the second quarter, RB Zack Leger turned a short pass into a 42 yard major. Linebacker Nathan Whidden did the D well with a pick 6 and a fumble recovery for bonus yards in the first half. Punter and placekicker Ryan Merlin would have a perfect evening as he kicked a 37 yard field goal, his first as a Tiger and go six for six on PATs. A staunch D kept UNBSJ deep in their end of the field and forced them to give up a safety touch making the half time score 26-7. Dalhousie did slip once with a few missed tackles which allowed a monstrous 90 yard run by Anders Blizzard to give the Seawolves their only major. Another rookie who brought praise was returner and running back, Zacchary Kuhn who returned a punt 60 yards for the Tiger’s first score of the second half. Zack two also provided some great relief for Zack one, last year’s AFL offensive MVP. Another back, Jason Watts, scored Dal’s last major on a short run. Defence and special teams, as with Dalhousie’s 2016 championship squad kept UNBSJ in poor field position all game. They forced another safety touch and probably a record pick 6 in a tilt as Tyson Young would complete the Tiger’s scoring total. The goal of any team and individual is perfection. The Tigers last season achieved that pinnacle and started that quest with their first victory of 2017. Coach Haggett and his very competent cache of coaches know the hardest thing they have to do is keep their rookie and veteran chargers grounded as they increase their football IQ. 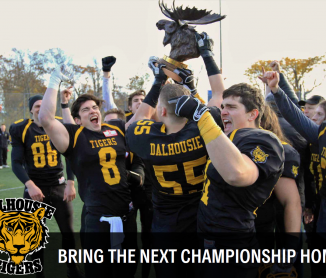 Jim Wilson wanted the Dalhousie campus to have FUN and FOOTBALL and that was evident as a large energetic contingent of spectators worked their voices and thunder sticks to heighten the atmosphere. Could 2017 be a repeat of the 2016 YEAR OF THE TIGER? Next home game is September 30th on Wickwire versus Holland College. Or you could take a road trip to Fredericton this Saturday to see the Tigers tangle with the Red Bombers who defeated the Hurricanes in their first competition.